Noel Coward (1899-1973) epitomized high British elegance and sophistication in the theater and life in general. As fluffy as his personality and his writing may have seemed to some, his pen was a sword that subtly sliced up hypocrisy, and questioned the morals around issues like adultery and privilege. Two of the master gay playwright’s greatest, yet most uncharacteristic, works are now settling into long runs at two major Minneapolis theaters: Brief Encounter on the Guthrie’s McGuire Proscenium and Blithe Spirit at the Jungle. The Guthrie’s Dowling Studio also will premiere a short run of Michael Todaro’s new Producing House musical Coward’s Women, with Maud Hixson and Erin Schwab. Brief Encounter is touring from London, having stopped stateside to raves in New York, San Francisco, and now Minneapolis. 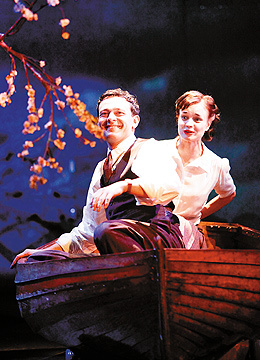 Produced by the Kneehigh troupe under the direction of Emma Rice, it emulates images inspired by David Lean’s exquisite 1945 film version, with influence from the original 1936 stage script titled Still Life. Seldom has a gay artist drawn so beautifully from his own marginalized gay position to empathize so richly with straight experience. Indeed, Coward presages the 1960s Sexual Revolution by a quarter-century. When Brief Encounter was released as a film, which was a huge hit, it resonated with the unspoken brief encounter countless soldiers and their wives or gals at home secretly would have shared with others because of being separated from their primary love during wartime. We also sense this sexual openness in Blithe Spirit, Coward’s loopy 1941 gem. Its tongue-in-cheek take on the occult appears all fun and games, but also entertains possibilities of mysticism and sexual freedom that would come to the forefront much later in the 1960s. And the spirit of these women can be felt on three local stages.